I like to make pancakes for breakfast on a Saturday. While I was making them last week I decided to do a post containing all of my pancake tips and my favourite recipe. Of course, I only decided when it was too late and the boys had eaten all of the pancakes, so I made some more this week and took photos. First off, here's my favourite recipe - I've tweaked one I found in a Betty Crocker cookbook. Beat the egg with hand beater until fluffy. Mix in remaining ingredients until just smooth. Tip 1: Don't overmix the batter, it will make tough pancakes. Tip 2: See the addition of vanilla essence to the recipe? This will make all the difference to your pancakes - trust me. 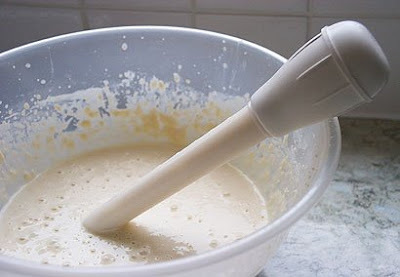 Tip 3: Add the milk slowly so that you can control the thickness of your batter. 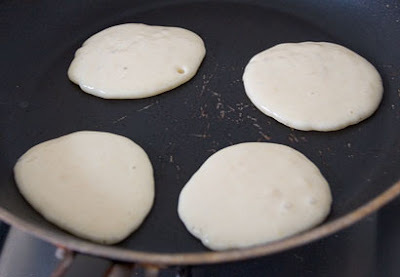 You want it nice and thick so that the pancakes are sturdy, but thin enough to pour or go into your baster. You may decided to add less milk than the recipe states, or more. Tip 4: I like to use a turkey baster to create the pancakes in the pan - it makes it easier to control size and shape and you can make fun shapes like cars (Noah's favourite), hearts, letters, etc. 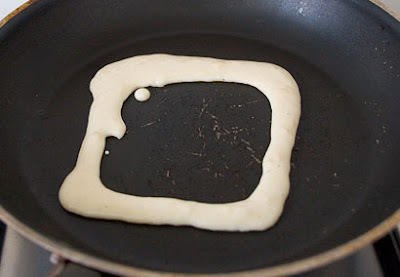 Tip 5: Make square / rectangular pancakes the size of a slice of bread. Freeze the pancakes (more on that later), then when you go to defrost / heat them just pop into the toaster - the straight edges ensure they stay put. Plus the non-round shape amuses Daniel. Then fill in with batter. Tip 6: Your pan needs to be medium to low heat. Wait until the bubbles burst and stay burst, then you know it's time to flip the pancake over for a few seconds. 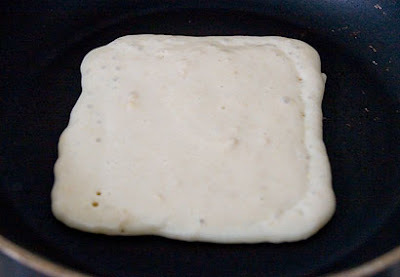 If the heat is too high the pancake will be too dark before you flip it over. 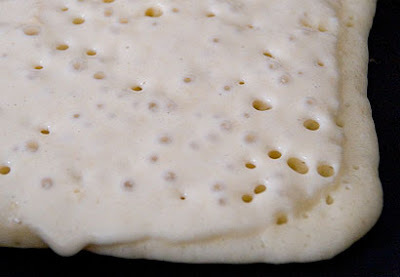 Tip 7: I like to make lots of little pancakes, about 2-3 inches in diameter. They are great for lunches or snacks - make little sandwiches with your favourite filling (more on that below). 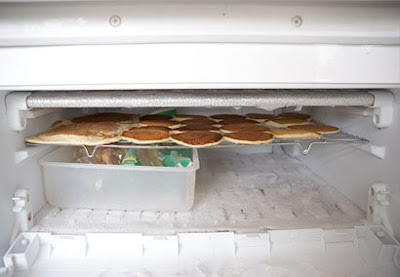 Tip 8: Freeze your pancakes. 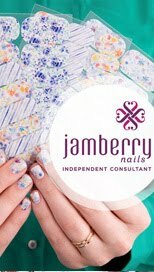 First cool them on a wire rack in a single layer so that they don't go soggy. Then slide the rack (or put them onto a cookie sheet) into your freezer. I'm lucky in that my cooling rack fits perfectly onto two side ridges in my freezer! When frozen, chuck them into a ziplock bag and back into the freezer. Freezing them this way ensures that they are all seperate and you can simply grab one or two any time you want to. 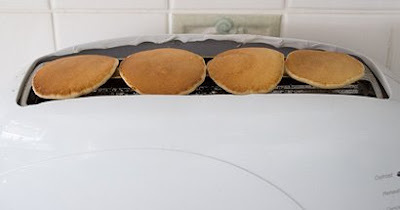 Tip 9: To defrost and heat frozen pancakes that are bread-slice size, simply pop into the toaster. To defrost and heat the little ones, lay them on top of the toaster and press the toaster lever down. Flip them over halfway through the toasting time to ensure they are evenly toasted on both sides. Tip 10: Make little sandwiches with the mini pancakes using peanut butter, chocolate spread, jam, apple butter, marmalade, frosting or any other favourite sweet filling. Tip 12: Serve a platter of cool mini pancakes with various toppings at your next get-together (baby shower, BBQ, etc). They can be prepared in advance and everyone likes little miniature things, right? They are so cute. 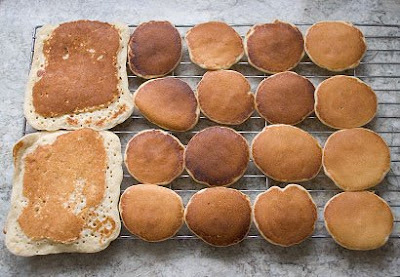 Mini pancakes are the new cupcakes - and you saw it here first! Tip 14: When making blueberry pancakes or chocolate chip pancakes don't mix the berries or chips into the batter. Instead, pour the pancake into the pan, then drop the berries or chips onto the pancake as the first side cooks. This ensures a nice even distribution. Tip 15: When cutting up a pancake for younger children to eat, use a pizza cutter wheel. Then drizzle on the syrup, etc.